My Master, bless me with your mercy….That the bumble-bee of my mind may over and ever again remain attached with the honey of your lotus feet. I am not concerned with any other water; please bless this songbird with a drop of your water, Lord. Unless I meet my Lord, I am not satisfied. Nanak lives, gazing upon the blessed vision of His darshan. 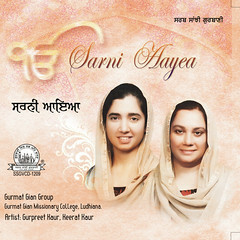 This entry was posted in Shabad Kirtan and tagged Gurbani Sangeet, Gurmat Gian Group, Gurmat Sangeet, Gurpreet Kaur, Japjit Kaur, Keerat Kaur, Keertan, kirpa, Kirtan, Raga Kalyan, Shabad, Shabad Kirtan. Bookmark the permalink. 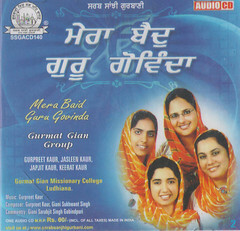 After a very long time I am having the blissful ANAND of listening to a very soulful rendering of Shabads by female kirtan singers.This was grossly missing from the massive anthology of the kirtan archives, the sikh jagat has built.Yours is a great step.Please carry the good work.Forever. Quite okay. 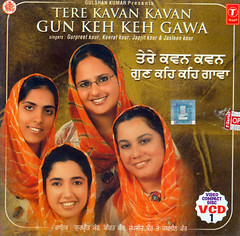 Now-a-days, many groups (both male/female) are bringing albums out with stereotyped sung Gurbani Shabads, mostly based on filmi songs/ punjabi songs. I am deeply aggrieved when I listen many hitech/advertised keertniyas singing Gurbani based on punjabi /hindi filmi songs & having same tunes. The higher authorities such as Akaal Takhat, SGPC, respected Taksals etc must take notice of such things, otherwise there will be great loss of traditions. Such fake raagis should be punished and barred. 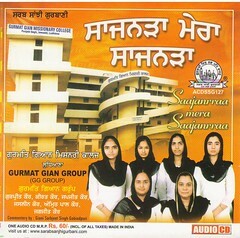 Secondly, many female Jathas are out who mostly sing Gurbani by copying previously sung tunes by famous raagis. This shows that they at their own have done nothing. Comments will be long and I stop. But, the Gurmat Gian Group is unique and classic. I heard today first time and I am masmerized. May Waheguru bless them all to serve the world by rendering Gurbani Keertan in traditional classical style. Am thrilled and in absolute bliss listening to the Shabad Kirtan’s being posted. piarey khalsa chhinderpal singh ji! No boubdt many of our ragis are not aware or perfect in ragas As these gusikhanis are and Its the tradition of gurbani to sing shabad in the same ragas as written in sggs. But some thing is better than nothing, when we were lacking taraditional ragis in sikh brother-hood,some filmi-tunes had been adopting &/or copying others. In gurudawar sisgunj,Delhi also some ragis in 1950′ tried to sing in filmi tunes & were objected by some sikhs like me then they stoped. And started singing bani in simple tunes without having knowledge of ragas. Well GGG has been very much blessed by the waheguruji and he is taking seva from them in very nice way traditions. “KIRPA KAREIN TAA NAAM DHAHAYAI JIO” So guru ji kripa ker ke ehna bachian tu sewa ley rahe hun. Waheguruji da beant shukkar hai. waheguru fateh and waheguru bless them all ggg privar to serve the sikh sangat saa2 simro gobind. eh sewa kerdey rahn ji. For our children to become good Ragees, as our Guru expects from us, our children need to put themselves to the rigorous learning of Indian Classical Music. Good Ragees can’t be produced overnight. 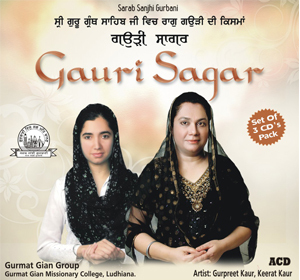 Raags are the base for singing and for us its a vehicle to present Gurbani. Unless a person puts in sufficient effort in developing the base the result is like half baked stuff. For Gurbani Singing we have to be more careful so that Raags do not become primary and Gurbani becomes secondary. Gurbani always has to be main presentation with raags remaining as secondary in the rendition of Gurbani Kirtan. We try our best to be careful while composing and recording the Shabads. To what extent we are successful only Guru knows. These days I am busy composing Shabads in various raags of SGGS. I have already composed shabads of Raags like Devgandhari, Sorath, Gurjri, Gauri, Mahj, Maaro, Suhee, Aasa, Ramkali, Bhihagra, Shree raag, Bhairav, Sarang, Malhar etc. I am waiting for my daughter Keerat Kaur (who is an important member of Gurmat Gian Group) to come to India from USA so that we can record all these Shabads and present them to the sangat. Guru’s Kirpa and good wishes from sangat would help us in our endevour to present Gurbani Kirtan in best possible format. Very beautiful and blissful, the words are so enticing that only through meeting the Lord that the mind gains peace and happiness, without this sweet honey the mind just wanders around like a bumble bee, that is so true. You are blessed with a beautiful voice & many of your compositions are extremely melodious but this one is the closest to my heart & soul. Anytime, any worldly tension grips me & makes me too stressed, I listen to this shabad & forget all my worries. After all, Guru Arjan Dev Ji tells us that “I am not concerned with any other water; please bless this songbird with a Drop of Your Water, Lord. And the composition in Kalyaan Raag is just so amazingly perfect & beautifully brings out the meanings of this shabad with precision & accuracy. I play this shabad on my mobile while going to sleep & no matter how tough my day has been, I always sleep instantly & peacefully when this shabad is playing. The fact that there are at least 4 Bibis singing this shabad adds to the ras of the shabad, which is sadly missing in the later compositions where Bibi Gurpreet Kaur Ji is primarily singing while Keerat Kaur Ji’s voice is present but only in a secondary & supporting role. And there are no other Bibis in the later albums. That doesn’t mean that the later albums aren’t good. However, my humble suggestion, which I also personally conveyed to Manbir Singh Ji on phone, is that if possible, please get more of your students involved in your recordings. I understand that the compositions in the later albums are tougher & demand more hard work & expertise: Taals used are not the common taals but rare ones, Aalaaps & Taans are tougher & the later albums (Raag Ratan & Gauri Sagar) are pure Raag Based but personally speaking (may be because I am a bit of a novice when it comes to classical music but I have been a serious listener of Gurbani Kirtan for at least a decade now), I prefer the earlier albums. However, despite being a novice, I do appreciate the kind of hard work that has gone into the later albums like Raag Ratan & Gauri Sagar. But do keep a healthy balance so that your blog caters to all kinds of listeners of Gurbani & classical music, with their varying tastes & preferences. Some prefer compositions which are a balance of classical & light music while others may prefer pure classical music. For example, of the 2 compositions in Kalyaan Raag, I find this one more soothing although I can appreciate that the other composition required much more hard work & skilfulness. As I wrote in my previous post, I play this shabad before going to sleep almost daily. It is just a humble suggestion but before signing off, I must thank you for this wonderful & Nishkam Sewa. I also do Ardaas to Waheguru Ji that may He keep you & your wonderful family forever in Chardi Kala & keep taking this wonderful sewa from you. With His grace, may you always keep singing Gurbani so melodiously & keep spreading its fragrance through this blog & otherwise also. May He grant you the same blessing, which Guru Arjan Dev Ji has asked for in this shabad. Thanks Amandeep Singh ji for being part of our cyber sangat and for appreciating the work done by Gurmat Gian Group. Gurpreet Kaur plans to keep recording shabads in all the raags as mentioned in Sri Guru Granth Sahib ji. There would be shabads having both Classical as well as semi classical touch. There are few students who are learning under the guidance of Gurpreet and whenever it is possible they would be part of the Group. Keep visiting. 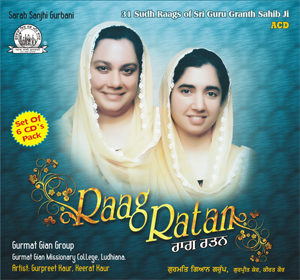 The Album on Raag Basant should be coming soon.